The word Kingdom means the domain of the King. It is where the King has dominion and where He rules. Although we absolutely want to experience the glory of His Kingdom manifest in our natural world, it must first manifest within us—in the hearts and minds of the children of the King. The King must rule in the thoughts of our minds. The King must rule in the feelings of our hearts. How can we give away something we have yet to experience? How can we shine His light in the world if our minds are still dark, not enlightened with the light of life? How can we share His love and compassion with the world if we don’t feel love and won’t forgive ourselves? Jesus said, “The Kingdom of God is within you” (Luke 17:21). He wants to extend His rule and to advance His Kingdom, and He says it starts with us. It starts in us. When our thoughts match His thoughts, and we live into the mind of Christ—that’s the Kingdom of God (1 Corinthians 2:16). When our emotions match His emotions, and we live into the fruit of the Spirit—that’s the Kingdom of God (Galatians 5:22). The best way to experience His rule and reign in the world is to experience His rule and reign in our lives personally—moment by moment, our thoughts obeying Christ (2 Corinthians 10:5), and our feelings aligned with God’s heart (1 Corinthians 13:13). The Kingdom of Heaven isn’t far removed from us, off in the distant future. The Kingdom begins inside of us. And it starts right now. So how can we get there? How can we live into and out of this Kingdom? One easy and effective way is by practicing Emotional Freedom Techniques (EFT). Tapping can empower us to release the fears and phobias, worry and anxiety, anger, stress and sadness that engulf us. We know these negative feelings have been subjected to the King’s rule. These are not God’s best for us, and now we can release the negativity and step into blessing. Now we are equipped to get from where we are to where we should be. How can we experience the abundant life for which Christ died? We tap into it! Tapping can get us in touch with our hearts, where Christ lives (Ephesians 3:17). In His presence is fullness of joy (Psalm 16:11). His love and peace overwhelm the dark spaces in our hearts and minds, flooding them with the light of His glory. Ephesians 4:18 illustrates how our minds can be darkened, and 2 Corinthians 4:6 reveals God’s desire of His light to shine in our hearts. We don’t have to struggle and fight the dark thoughts and emotions. We simply have to live in the light. Tapping can connect us to the Light of the World, who lives within us (John 8:12). Indeed, we were formerly darkness, but now we ourselves are light in the Lord (Ephesians 5:8). EFT can keep us plugged in to His infinite power source. Jesus died for us to live in His peace and joy and hope and love today—not in the sweet by and by. Tapping can be a vehicle that moves us into that safe, positive place—here and now. We don’t have to wait any longer; Jesus already gave us all His blessing, healing, provision and salvation at the cross. We must actively receive and appropriate these gifts and live as if our prayers have already been answered because, in fact, they already have (1 John 5:14–15). When our mind is in the alpha brainwave state, the inner world is more real than the outer world. We are not looking at the things that are seen, but the things unseen (2 Corinthians 4:18). The Apostle John called it being “in spirit” (Revelation 1:10; 4:2). Indeed, it’s living to the Kingdom of Heaven within us. Scientifically proven, EFT moves us into our alpha-level brainwave state, in which we are our most peaceful, intuitive and creative. Even if that were the only benefit, it would be reason enough to tap early and tap often! I go out of my way every single day to live in this alpha state. I undertake dream interpretation work because we receive dreams during alpha-state REM sleep. I pray and sing in tongues throughout the day because that shifts me from analytical beta brainwaves into the desired meditative and reflective alpha state. Dream work, praying in tongues, tapping—I often engage in all three activities simultaneously. I meditate on my night vision from Heaven, pray into it in the Spirit, and tap the revelation deep into my cells and my heart. When we experience life while in the alpha brainwave state, we have moved down into our spirit and are living from our heart zone. Jesus lives in our hearts, so we want to live into our heart—and out of our heart as well. From our heart flows everything else in our lives (Proverbs 4:23). What If God Held His Breath? The Lord spoke an awesome word to my teaching assistant, Patty Sadallah, in her journaling time. God confirmed His intimate connection with each one of us when He explained, “If I held My breath, all creation would cease to exist.” Yes! The Hebrew word for “breath” is ruach and also means “spirit.” In Genesis, we read that God breathed into man the breath of life, and he became a living being. It is the very Spirit and breath of God Himself that animates, energizes and gives life to our physical bodies. One of my favorite tapping verses is in the Book of Job: “The Spirit of God has made me, and the breath of the Almighty gives me life” (Job 33:4). Everyone has this spirit in them. All who are alive—they are breathing God’s breath. Christ is all and is in all (Colossians 3:11). Indeed, He is not far from any one of us, for it is in Him that we live and move and have our being (Acts 17:27–28). We want His Spirit to flow unhindered. We want His energy to surge through us unimpeded and unobstructe d. We want His breath to move freely around us, within us, and through us. The spirit—or the literal translation breath—of man is the lamp of the Lord, searching the innermost parts of his being (Proverbs 20:27). Through EFT we can remove barriers, allowing His Spirit to flow unrestrained. Through tapping we can unstop His River in our lives. This is one way to work out our soul’s salvation, knowing it is God who is at work in us, accomplishing His good pleasure (Philippians 2:12–13). Holy Spirit does the work. Holy Spirit is the one who heals us, gives us breakthrough and sets us free. Through tapping, we simply position ourselves to allow His breath, river, spirit, energy, and presence to flow most powerfully through us. Can we stop the blessings of God? Of course we can. Can we position ourselves to receive the greatest outpouring available? Of course we can. The choice is ours. And EFT gives us a powerful way to choose well. 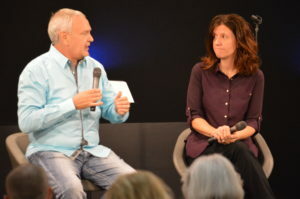 Dr. Jim Richards and I had a fantastic time sharing our experiences with EFT at his Heart Physics conference last month. If you weren’t able to join us, you can now get the full weekend of audio teaching plus two bonus video sessions demonstrating all the tapping points. You can find out details on this new MP3 series here. 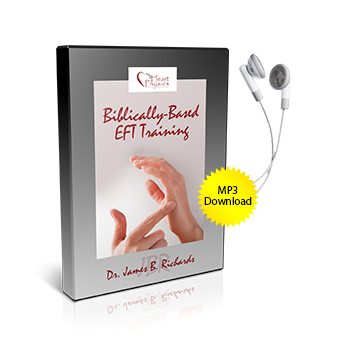 Read more about EFT here! Why were we created? What is our reason for being? How can we move into the Alpha brain wave state, and why would we want to? How addressing the negative emotions surrounding injuries and accidents can bring relief from physiological pain. How can we tap into the river of life Jesus said is flowing within us? Could tapping really be “therapy at the speed of light”? I am blessed with every spiritual blessing in heavenly places in Christ.